Monster Honda’ s American rider Ricky Brabec staged an coup d’état at the fourth stage of the Dakar Rally, not only battling to victory on the day, but also storming the first place spot on the overall leader board. 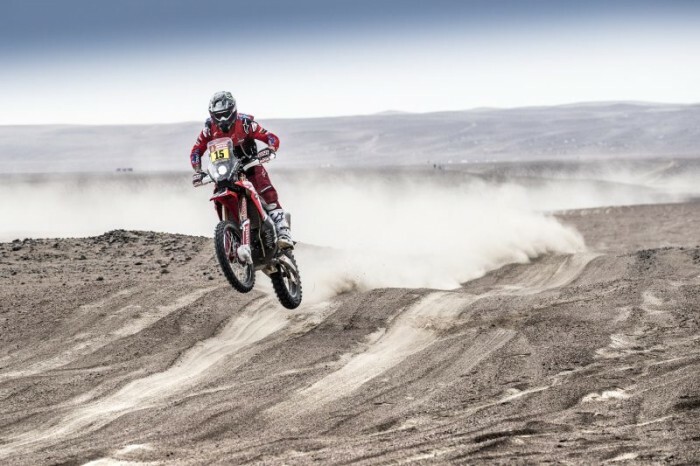 Yesterday saw the first leg of the marathon stage at the 2019 Dakar en route from Arequipa to Moquegua, where the 124 remaining motorcycle riders had an early start to cover the opening 85-kilometre link section before the first part of the 205-kilometre special. The day was soured by biting cold and humidity in both the city and the mountainous regions. Ricky Brabec set off like a bat out of hell, marking the best time in the process. After a neutralization of 54 kilometres, the second part of the special, over 146 kilometres, proved even better for the American, who cruised home with a six-minute advantage over the nearest finisher, dethroning the previous overall leader Pablo Quintanilla with a walloping 20 minute gap. In doing so, Brabec triumphs for the second time in a stage after the victory in 2017 on the La Paz-Uyuni stage. The American takes the head of the overall rankings for the first time in the world’s toughest rally. I needed it. I needed a victory like that! I wanted to push because as we had studied yesterday, winning today would be able to help me in tomorrow’s stage. We will have the mass motocross-style start, just like on the motocross starting grids,” said Brabec.